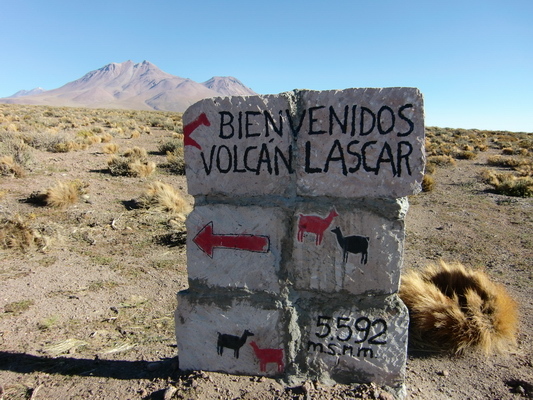 Lascar is the most active volcano in the Northern part of Chile. It is a huge mountain with several peaks up to 5592 meters and an enormous smoking crater. The ascent is very popular, because it is just 100 kilometers away from San Pedro de Atacama and a height of 4800 meters can be reached with a good four wheel car. Consequently many tour offices in San Pedro offer the ascent of Lascar. The first destination is the marvelous Laguna Lejia which can be accessed by a dirty gravel road from the Toconaco, which is located at the main street to the Paso Sico, approximately 40 km south of San Pedro de Atacama. We decided to try to drive to the Laguna Lejia with our camping car. If it became too difficult for our car we had the idea to use our bicycles.